The retro- and hypotympanum are hidden areas of the middle ear, only poorly recognized. Nevertheless, this region is of relevant clinical significance, since it is regularly affected by disease such as cholesteatoma. 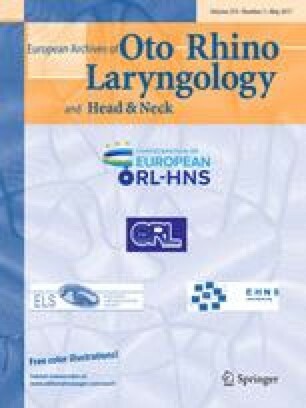 The aim of this study is to explore and describe the anatomical variants of the hypo- and retrotympanum by the means of transcanal endoscopy. We hypothesize a significant variability of this hidden region of the middle ear. Moreover, we believe that the minimal invasive, endoscopic access is suitable since angled scopes may be used to explore the region. To this end a total of 125 middle ears (83 cadaveric dissections, 42 surgical cases) were explored by the means of 3 mm straight and angled scopes. The variants were documented photographically and tabularized. The bony crests ponticulus, subiculum and finiculus were most frequently represented as ridges. The ponticulus showed the highest variability with 38% ridge, 35% bridge and 27% incomplete presentation. The subiculum was bridge-shaped only in 8% of the cases, the finiculus in 17%. The sinus tympani had a normal configuration in 66%. A subcochlear canaliculus was detectable in 50%. The retro- and hypotympanum were classified, respectively, to the present bony crests and sinus in a novel classification type I–IV. In conclusion, we found abundant variability of the bony structures in the retro- and hypotympanum. The endoscopic access is suitable and offers thorough understanding and panoramic views of these hidden areas. LA holds a research fellowship by the Bangerter-Rhyner Foundation, Bern, Switzerland and by Karl Storz GmbH, Tuttlingen, Germany. The funders had no role in study design, data collection and analysis, decision to publish or preparation of the manuscript. Therefore, the authors declare no conflict of interest. All procedures performed in this study involving human participants were in accordance with the ethical standards of the institutional, regional and national research committee and with the 1964 Declaration of Helsinki and its later amendments or comparable ethical standards.